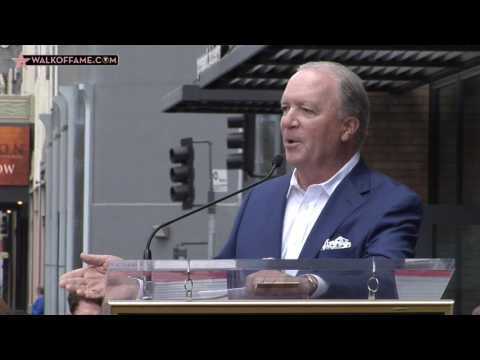 The Hollywood Chamber of Commerce proudly honored television producer, Ken Corday, with the 2,612th star on the Hollywood Walk of Fame today, May 15, 2017, at 11:30 a.m. PDT. The star in the category of Television was dedicated at 6201 Hollywood Boulevard in front of Eastown. Helping Emcee and Hollywood Chamber President/CEO Leron Gubler to unveil the star was guest speaker and fellow Walk of Famer Andy Garcia. Ken Corday was a teenager in 1965 when his parents, co-creators Ted and Betty Corday, launched Days of our Lives. A year after the show’s inception, his father passed away unexpectedly leaving Betty to carry on the show while teaching Keneverything he would need to know to continue his family’s legacy. The skills he learned from his mother lead to his37-year tenure of Days of our Lives which allowed him to revolutionize television history while touching the hearts of millions of fans for generations worldwide. Ken received his bachelor of arts in Music from the University of California, Santa Cruz and a Master’s in Music from San Jose State University. Hefirst served as Days of our Lives’ music composer (a position he still fills to this day) for nearly ten years before taking on the role of assistant producer in 1980, and then producer in 1981. Kenbecame the executive producer in May 1985, and is responsible for catapulting the show to the powerful pop-culture hit that it is today. Kenhas received multiple daytime Emmy nominations and wins for Outstanding Drama Series as the show’s Executive Producer over the years (nabbing the prize most recently in both 2013 and 2015). He has also received multiple nominations and wins for Music Direction and Composition for a Drama Series for which he has won four daytime Emmy awards (most recently 2016 and 2017). Additionally, Kenhas been honored with four People’s Choice Awards, two TV Guide Awards and twelve Soap Opera Digest Awards. As Hollywood’s longest running television producer, Kenknows that compelling stories and dynamic characters are what audiences are hungry for, and after more than 13,000 episodes and half a century on NBC, he’s definitely cracked the code to success in this genre. His passion for the show is reflected in the millions of viewers worldwide who tune in everyday to watch the Hortons, Bradys, and DiMeras, and have made Days of our Livesa part of their family. In addition to continuing the family’s television legacy, Kenis an avid philanthropist and a believer in the importance of giving back. He has dedicated much of his efforts to changing children’s lives by providing hope and offering hands-on support for medical mission trips around the globe. Introduced to Operation Smile by NBC President Jennifer Salke in 2009, and after years of supporting the organization, Ken was honored with their John Connor Humanitarian Award at the charity’s annual gala in 2014. In addition, Ken and wife, Sherry, are actively involved in helping to sustain the philanthropic efforts of a number of worthy causes including the Los Angeles Children’s Hospital, LA Mission, George Lopez Foundation, The National Kidney Foundation, the SAG-AFTRA Foundation, the San Fernando Valley Rescue Mission, Matthew Shepard Foundation, Race to Erase MS, and JDRF.